Are We About to Go to War With Pakistan? We have to ask this question despite the assurances we are being given. There’s been a flurry of diplomatic activity within the last 24 hours. Earlier today, Sept. 16th, the chairman of the Joint Chiefs of Staff, Adm. Mike Mullen, made a hastily arranged flight to Pakistan for talks. 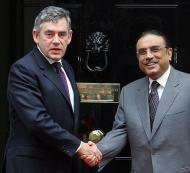 Pakistani President Asif Ali Zardari, meanwhile, is in London and had talks with Prime Minister Gordon Brown. Adm. Mullen was in talks about recent raids by American soldiers into Pakistan from Afghanistan. Zardari, Bhutto’s widower, was seeking Britain’s help in the growing conflict Pakistan has with the United States about these raids. This round of diplomacy is all in the context of growing anger in Pakistan about US incursions, and in the shadow of the orders given Pakistani military: if US military invades again, shoot back. Has the U.S. Invasion of Pakistan Begun? As Andrew Bacevich tells us in the latest issue of the Atlantic, there’s now a vigorous debate going on in the military about the nature of the “next” American wars and how to prepare for them. However, while military officers argue, that “next war” may already be creeping up on us. Having, with much hoopla, launched wars in Afghanistan and Iraq, each disastrous in its own way, the Bush administration in its waning months seems intent on a slo-mo launching of a third war in the border regions of Pakistan. Almost every day now news trickles out of intensified American strikes — by Hellfire-missile armed Predator drones, or even commando raids from helicopters — in the Pakistani tribal areas along the Afghan border; and there is a drumbeat of threats of more to come. All of this, in turn, is reportedly only “phase one” of a three-phase Bush administration plan in which the American military “gloves” would “come off.” Think of this as the green-lighting of a new version of that old Vietnam-era tactic of “hot pursuit” across national borders, or think of it simply as the latest war. Already Pakistan’s sovereignty has functionally been declared of no significance by our President, and so, without a word from Congress, the American war that already stretches from Iraq to Afghanistan is threatening to widen in ways that are potentially incendiary in the extreme. While Pakistani sources report that no significant Taliban or al-Qaeda figures have been killed in the recent series of attacks, anger in Pakistan over the abrogation of national sovereignty and, as in Afghanistan, over civilian casualties is growing. In Iraq, 146,000 American soldiers seem not to be going anywhere anytime soon, while in Afghanistan another 33,000 embattled American troops (and tens of thousands of NATO troops), suffering their highest casualties since the Taliban fell in 2001, are fighting a spreading insurgency backed by growing anger over foreign occupation. The disintegration seems to be proceeding apace in that country as the Taliban begins to throttle the supply routes leading into the Afghan capital of Kabul, while the governor of a province just died in an IED blast. “President” Hamid Karzai was long ago nicknamed “the mayor of Kabul.” Today, that tag seems ever more appropriate as the influence of his corrupt government steadily weakens. In the meantime, in Pakistan, a new war, no less unpredictable and unpalatable than the last two, develops, as American strikes fan the flames of Pakistani nationalism. Already the Pakistani military may have fired its first warning shots at American troops. Part of the horror here is that much of the present nightmare in Afghanistan and Pakistan can be traced to the sorry U.S. relationship with Pakistan’s military and its intelligence services back in the early 1980s. At that time, in its anti-Soviet jihad, the Reagan administration was, in conjunction with the Pakistanis, actively nurturing the forces that the Bush administration is now so intent on fighting. No one knows this story, this record, better than the Pakistani-born journalist and writer Tariq Ali. In my view, however, the expansion of the war relates far more to the Bush administration’s disastrous occupation in Afghanistan. It is hardly a secret that the regime of President Hamid Karzai is becoming more isolated with each passing day, as Taliban guerrillas move ever closer to Kabul. When in doubt, escalate the war is an old imperial motto. The strikes against Pakistan represent — like the decisions of President Richard Nixon and his National Security Adviser Henry Kissinger to bomb and then invade Cambodia (acts that, in the end, empowered Pol Pot and his monsters) — a desperate bid to salvage a war that was never good, but has now gone badly wrong. It is true that those resisting the NATO occupation cross the Pakistan-Afghan border with ease. However, the U.S. has often engaged in quiet negotiations with them. Several feelers have been put out to the Taliban in Pakistan, while U.S. intelligence experts regularly check into the Serena Hotel in Swat to discuss possibilities with Mullah Fazlullah, a local pro-Taliban leader. The same is true inside Afghanistan. After the U.S. invasion of Afghanistan in 2001, a whole layer of the Taliban’s middle-level leadership crossed the border into Pakistan to regroup and plan for what lay ahead. By 2003, their guerrilla factions were starting to harass the occupying forces in Afghanistan and, during 2004, they began to be joined by a new generation of local recruits, by no means all jihadists, who were being radicalized by the occupation itself. Though, in the world of the Western media, the Taliban has been entirely conflated with al-Qaeda, most of their supporters are, in fact, driven by quite local concerns. If NATO and the U.S. were to leave Afghanistan, their political evolution would most likely parallel that of Pakistan’s domesticated Islamists. The neo-Taliban now control at least twenty Afghan districts in Kandahar, Helmand, and Uruzgan provinces. It is hardly a secret that many officials in these zones are closet supporters of the guerrilla fighters. Though often characterized as a rural jacquerie they have won significant support in southern towns and they even led a Tet-style offensive in Kandahar in 2006. Elsewhere, mullahs who had initially supported President Karzai’s allies are now railing against the foreigners and the government in Kabul. For the first time, calls for jihad against the occupation are even being heard in the non-Pashtun northeast border provinces of Takhar and Badakhshan. The neo-Taliban have said that they will not join any government until “the foreigners” have left their country, which raises the question of the strategic aims of the United States. Is it the case, as NATO Secretary-General Jaap de Hoop Scheffer suggested to an audience at the Brookings Institution earlier this year, that the war in Afghanistan has little to do with spreading good governance in Afghanistan or even destroying the remnants of al-Qaeda? Is it part of a master plan, as outlined by a strategist in NATO Review in the Winter of 2005, to expand the focus of NATO from the Euro-Atlantic zone, because “in the 21st century NATO must become an alliance… designed to project systemic stability beyond its borders”? Such a strategy implies a permanent military presence on the borders of both China and Iran. Given that this is unacceptable to most Pakistanis and Afghans, it will only create a state of permanent mayhem in the region, resulting in ever more violence and terror, as well as heightened support for jihadi extremism, which, in turn, will but further stretch an already over-extended empire. Globalizers often speak as though U.S. hegemony and the spread of capitalism were the same thing. This was certainly the case during the Cold War, but the twin aims of yesteryear now stand in something closer to an inverse relationship. For, in certain ways, it is the very spread of capitalism that is gradually eroding U.S. hegemony in the world. Russian Prime Minister Vladimir Putin’s triumph in Georgia was a dramatic signal of this fact. The American push into the Greater Middle East in recent years, designed to demonstrate Washington’s primacy over the Eurasian powers, has descended into remarkable chaos, necessitating support from the very powers it was meant to put on notice. Pakistan’s new, indirectly elected President, Asif Zardari, the husband of the assassinated Benazir Bhutto and a Pakistani “godfather” of the first order, indicated his support for U.S. strategy by inviting Afghanistan’s Hamid Karzai to attend his inauguration, the only foreign leader to do so. Twinning himself with a discredited satrap in Kabul may have impressed some in Washington, but it only further decreased support for the widower Bhutto in his own country. Saying, however, that the Army will safeguard the country’s sovereignty is different from doing so in practice. This is the heart of the contradiction. Perhaps the attacks will cease on November 4th. Perhaps pigs (with or without lipstick) will fly. What is really required in the region is an American/NATO exit strategy from Afghanistan, which should entail a regional solution involving Pakistan, Iran, India, and Russia. These four states could guarantee a national government and massive social reconstruction in that country. No matter what, NATO and the Americans have failed abysmally. Tariq Ali, writer, journalist, filmmaker, contributes regularly to a range of publications including the Guardian, the Nation, and the London Review of Books. His most recent book, just published, is The Duel: Pakistan on the Flight Path of American Power (Scribner, 2008). In a two-part video, released by TomDispatch.com, he offers critical commentary on Barack Obama’s plans for Afghanistan and Pakistan. PESHAWAR: The Taliban have agreed to abide by a peace agreement with the Ahmedzai Wazir tribes in South Waziristan, and to defer attacks on the government forces in retaliation for US drone attacks against suspected Al Qaeda terrorists and Taliban, a tribal source said on Tuesday. “There have been successful talks with senior Taliban leaders and we have won their backing for the peace agreement until the end of Ramazan,” a tribal elder told Daily Times by phone from Wana, the headquarters of South Waziristan. He said a jirga of Ahmedzai Wazir elders had met the Taliban leaders in Wana on Monday. 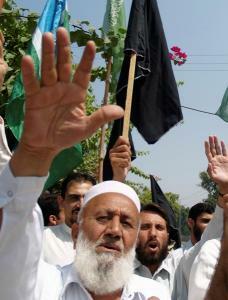 The Wazirs had made the peace agreement in March 2007 after the ouster of Uzbek militants from Wana. Revenge: “We have told the Taliban that Pakistan can do little to stop drone attacks and they should take revenge from the US if they wish so and not from the Pakistani forces,” the tribesman said. “It was decided in the meeting that the Taliban will take no action against the army at least until the end of Ramazan. We will meet again after Ramazan to discuss the situation as the Ahmedzai Wazirs do not want peace to be disturbed,” the Wazir elder said. A grand jirga of the Ahmedzai Wazirs will meet in Wana today (Wednesday) to take up the issue of continued drone attacks.